I don't want to write this today. I've delayed doing it. I've contemplated NOT writing today. Because we all know....if we don't write it then it didn't happen right? 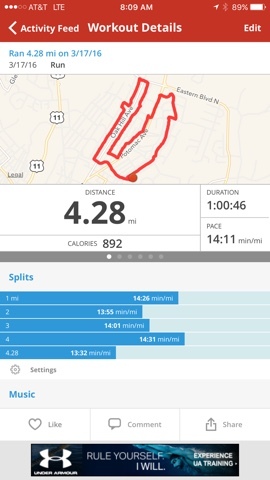 I DID get up and run Thursday morning and ran!!! However, otherwise, it didn't get better. Food wise I skirted with disaster! I was over my 1200 calorie goal EVERY day. One day I only missed it by 50 calories...so that was a victory. Two days I was in the 1300 range...so not too bad on those. Some of those days I ate least ran or hiked. However......the weather turned and well....... Ok, so here are the week stats. The one on the left is the TOTAL calories. 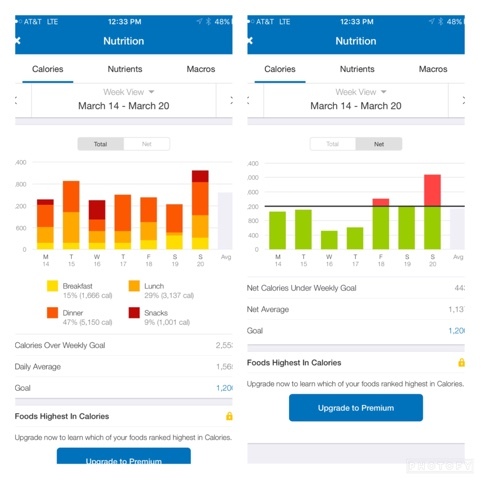 The screenshot on the right is the net calories including what I earned. I have been doing GREAT with pounding the water. My water intake has been spectacular of late!!! I've been consistently going over 100 ounces daily! So as for my goals that I set last Monday. 2. Run at least 2 times (preferably 3!) Definitely got two runs in!! VICTORY!!! You know...the goals for next week are going to be the same. I will be taking hiking off the list. Not because I don't want to hike/walk or don't plan on hiking/walking...but that one is dependent upon the weather, scheduling and whatnot. 4. Use the stair stepper at least ONCE! It is funny how one little thing messes us up and then we think all is lost. The weather often messes me up when it turns cool after being nice. So, you went over a little on calories. When I look at the goals you set for the week, I see more goals met than not. That is a victory! You tracked - that is a HUGE win!! I give up tracking when I go over (which is always these days) - I know tracking regardless is key. I need to be able to do that. And getting up to run - great win!!!! I agree with Shelley above (and I must admit I AM eating ridiculous junk when I overdo it). I really think you are doing good! I used a stair stepper ONCE ... and I don't think I'll be doing it again, it was HARD! Your 1200 is too low of a calorie intake for you with your activity level. Go to calculator (dot) net or another site that has a calorie intake calculator. For me to LOSE weight - it says that I should be taking in around 1900 calories a day. I believe Jenny Craig won't let people go below 1500.